The first Sky Guardian customer is the RAF, which has named it the Protector. The RPAs will be operated by No. 31 Squadron. 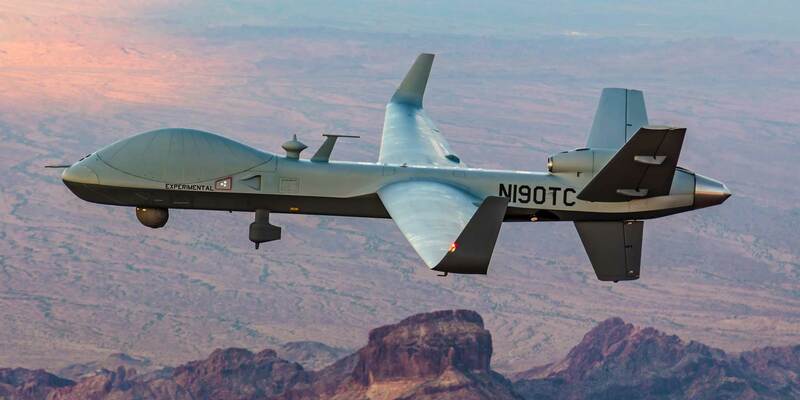 Except for the winglets, the MQ-9B SkyGuardian remotely piloted aircraft (RPA) that is being test-flown in the Mojave Desert may not look any different from the familiar MQ-9A Reaper. But inside this machine, and in the way that it communicates and is controlled, there are big changes. General Atomics Aeronautical Systems Inc. (GA-ASI; Hall 2, Stand 2078) has been developing the SkyGuardian since 2012 and secured the UK Royal Air Force (RAF) as the launch customer four years later. There are two key innovations to the Sky Guardian, which the RAF is naming the Protector RG.Mk 1. One is that it is being built and certified to fly in controlled airspace, alongside civil air traffic. In all the years that the U.S. Air Force (and the RAF) has been flying MQ-9A Reapers and the smaller predecessor MQ-1 Predator, they have been flown in airspace with little or no non-military air traffic such as in the Middle East, and over Afghanistan, Iraq, and Syria. The other key innovation is full satellite communications (satcom) control from start to finish of each flight. Although the Predators and Reapers have always used satcom for flight and weapons control as well as the relay of data from their sensors during a mission, their takeoffs and landings have been controlled manually by a line-of-sight datalink. This need for a Launch and Recovery Element (LRE) ground station has at least doubled the airlift and manpower requirements. GA-ASI previously referred to the SkyGuardian as the Certifiable Predator B, and it has been designed to meet global airworthiness standards, including NATO STANAG 4671. The structure is stronger and has protection against lightning; the fatigue life has been doubled (to 40,000 hours); the wings have de-icing; and the flight control software is more robust. The new RPA will be equipped with a new system to “sense and avoid” other air traffic consisting of TCAS, ADS-B and IFF, plus GA-ASI’s own Due Regard Radar. Unlike the Reaper, the SkyGuardian will have Automatic Takeoff and Landing Capability (ATLC). This can be controlled by satcom from a ground control station (GCS) anywhere in the world, as can the operation of the RPA on the ground–engine start and stop and taxi. The prototype SkyGuardian made its first flight in November 2016. In May 2017 it set a new endurance record for any GA-ASI RPA of over 48.2 hours. A significant milestone occurred last December when it flew out of Laguna Army Airfield near Yuma, Arizona, while being controlled by aircrew in a GCS located about 300 miles away at GA-ASI’s Gray Butte airfield near Palmdale, California. A second air vehicle is due to fly in the next few weeks. Last month, a successful test flight of GA-ASI’s sense-and-avoid system took place (the company calls it the Detect And Avoid [DAA] system). An Ikhana (i.e. a Reaper owned by NASA) took off from Edwards AFB and flew through the U.S. National Airspace System in southern California. “Our DAA system is more capable than the collision avoidance systems required on today’s commercial manned aircraft, and we believe it far exceeds the average pilot’s ability to ‘see and avoid,'” claimed David R. Alexander, president, aircraft systems, GA­-ASI. The RAF expects to receive the first of 16 Protector aircraft and eight advanced ground stations in 2021, for service with No. 31 Sguadron. The UK Ministry of Defence (MoD) signed an FMS contract worth £415 million (US$550 million) in November 2016, and later signed another contract for some UK-specific requirements. These include carriage of MBDA Brimstone 2 air-surface missiles and Raytheon UK Paveway IV 500-pound dual-mode guided bombs, plus addition of X-band satcom so that the UK Skynet satellites can be used. (The RAF’s existing Reapers are equipped with the same weapons and communications as the USAF's: Hellfire missiles, GBU-12 500-pound laser-guided bombs, and Ku-band satcom. The SkyGuardian/Protector is designed with six weapons stations, versus four on the Reaper, and offers a 50 percent greater payload). Since 2014 the RAF has had engineers embedded within GA-ASI, assisting with design elements. The extent to which the RAF will be able to operate the Protectors within UK airspace, at least initially, is not yet clear. Ideally, the new RPAs should be based at the Waddington airbase near Lincoln, where an earlier generation Block 15 GCS is already located. It shares control of the RAF Reapers that fly over Iraq and Syria with another RAF GCS located at Creech AFB, Nevada, alongside USAF-operated GCS. The eight-hour time difference between the two locations allows RAF aircrew to avoid nightshifts by transferring mission control between the U.S. and the UK. The aircraft themselves are based in Kuwait, having previously operated out of Kandahar. The sensors on the Protectors will be the same as on the current Block 5 version of the Reaper. They are the Raytheon high-definition EO/IR video plus laser targeting system that is designated the Multi-Spectral Targeting System (MTS-B), and GA-ASI’s own Lynx SAR/GMTI radar. The choice of that radar, which is already fitted to the Reaper, was made despite adverse assessments in 2016 and 2017 by the U.S. Director of Operational Test and Evaluation (DOT&E), and a previous trial fitting to a Reaper of a British radar, the Leonardo Seaspray 7500E. The DOT&E said that due to “complicated” human-machine interfaces in the Reaper GCS, the wide-area swath mode of the Lynx could not be used. Moreover, the Pentagon’s testing watchdog also had criticisms of the Block 5 Reaper airframe, saying that it “breaks more often and is harder to maintain” than the original Block 1 version. GA-ASI delivered the last of 195 Block 1 Reapers in early 2015. The USAF plans to acquire 155 Block 5s, with production lasting until Fiscal Year 2021. The first Block 5s were fielded a year ago, along with the Block 30 version of the GCS. The USAF is seemingly not interested in the Sky Guardian. The DOT&E’s verdict was a rare blot on the reputation of GA-ASI, which was credited with re-writing the rules of air warfare with its RPAs, and is still widely recognized as innovative and agile. The company announced last April that its family of RPAs had amassed five million flight hours. Over two million of these have been on the MQ-9 Reaper. On Wednesday evening, the prototype General Atomics (GA-ASI) MQ-9B SkyGuardian flew into RAF Fairford to appear at the Royal International Air Tattoo. It had taken off from Grand Forks AFB, North Dakota, 24 hours and two minutes previously, making the first transatlantic flight by a MALE RPA. Control of the MQ-9B throughout the flight was undertaken by a Ground Control Station (GCS) at Grand Forks via the vehicle’s Ku-band satellite link, with two crews undertaking 12-hour shifts. A back-up Inmarsat satellite link was also fitted for the flight, and a line-of-sight GCS was established at Fairford to provide a backup for recovery, as well as to take over control of the vehicle on the ground at the English base once it had come to a halt on the runway. Cruising at 27,000 feet, the MQ-9B flew northeast from Grand Forks over Canada, then skirted to the south of Ireland as it approached the UK, coasting in over Aberporth in Wales. The vehicle was placed in a 9,000-foot orbital hold for around two hours before landing at Fairford. After the show, the MQ-9B is being airfreighted back to the U.S.